Electronic Kit School. - Commonly rechargeable cell battery have 1.2 volt a cell with many kinds of current output. With rearrange the cell series and parallel it will make different output voltage and current. When we arrange 2 cells series it will result 1.2 volt x 2 = 2.4 volt. But, if we arrange parallel 2 cells with 1200 mAh, it will result the output 1.2 volt with 2400 mAh. Rechargeable cell like NiCAD battery need special charger to charge the cell to fill the power again. We need 2 volt charger to charge one cell 1.2 volt. And we want to charger 2 cells series it need 3 volt charger 2.4 volt cells and etc. So, when you want to charger many kind or multi voltage cell arrangement you need multi battery charger. 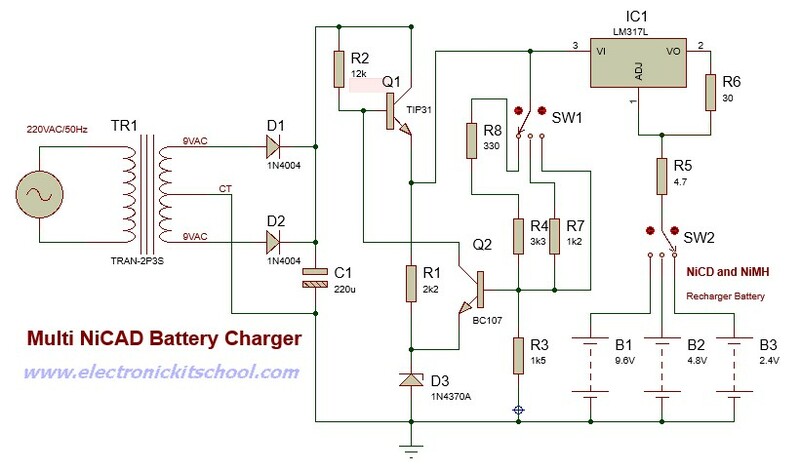 In this article we will give you one electronic circuit design that give you multi NiCAD battery charger for 2.4 volt cells (2 cells), 4.8 volt cells (4 cells), and 9.6 volt cells (8 cells) like shown in Figure 1 below. The main component to result the different or multi voltage output is LM317L as adjustable and regulated voltage supply. 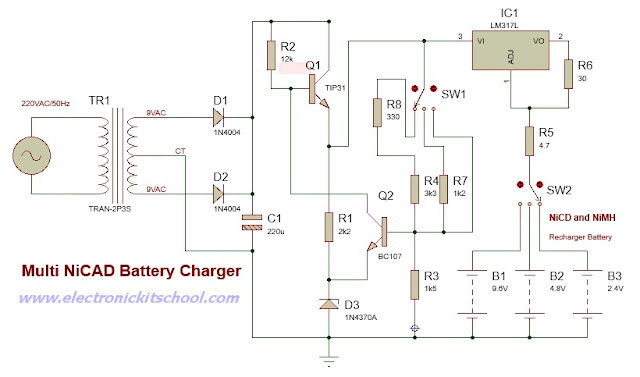 Circuit like in Figure 1 above show you about Multi NiCAD Battery Charger Circuit using LM317L that can charger your 2 cells, 4 cells, and 8 cells rechargeable battery NiCD and NiMH. The principles of a NiCAD Battery charging basically consist of two number of ways, these are a constant current and constant voltage. Constant Current, it need can provide with the current 500 mAh charge rate that is 1/10 of the current capacity. So, we should be charged with a constant current 50mA for 10 hours, but actually want to charge for 14-16 hours because when near full current to charge less. When we implement in the NiCAD battery charger for fast charging current to about 100 mA charging rate for 3-5 hours. This condition make the disadvantage of charging, it because when the battery is fully charged, you must remove it, otherwise the chemical substances in the battery will be very hot and damage. Note that a slow charger will not do, because this is can make the withstand heat. Constant Voltage. When you charger the rechargeable battery like in the NiCAD battery, it need in each battery a voltage 1.2 volt, when it is fully charged voltage 1.25-1.3 volt. In here when design charger circuit we need plus the voltage additive, such as 4 pieces, then the charging voltage 1.2×4 = 4.8V. But the charge like this, at first, a very high current flow. So, the voltage between NiCAD battery charger and very different, may have caused overheating and damage that you must anticipate. The two principles above make the guidance when we want to design NiCAD rechargeable battery specially when we choose any component that used in this circuit. So, to provide voltage and current to charger, we choose LM317L to give these principles. LM317 as a constant current. Determined by the R6. In the circuit be defined output current (Iout) is about 50mA. If you want to current different from this, you can find out the R6. = 1.25V / Iout. The output voltage also will constant according the switch selected. From the circuit that 3V be applied to 2 cells (2.4V), 5.5V be applied to 4 cells (4.8V) and 10.3V be applied to 6 cells (9.6V). So, if you want to charge your cell, you should select the switch 1 and switch 2 according the cells number.